Genesect Douse in game: 843 Who? Important notice! Pokemon Genesect Douse is a fictional character of humans. Genesect (Japanese: ????? 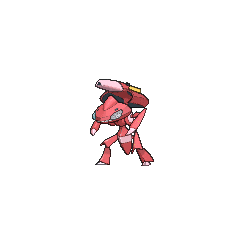 Genesect) is a dual-type Bug/Steel Mythical Pokémon introduced in Generation V.
While it is not known to evolve into or from any other Pokémon, the Drive inserted in the cannon on its back is visibly different within its sprites depending on the Drive it is holding. When it is not holding any Drive, the light is orange and Techno Blast is Normal-type. When it is holding the Burn Drive, the light turns red, and Techno Blast is Fire-type. When it is holding the Douse Drive, the light turns blue and Techno Blast is Water-type. When it is holding the Shock Drive, the light turns yellow and Techno Blast is Electric-type. When it is holding the Chill Drive, the light turns white and Techno Blast is Ice-type. Genesect was leaked in the August issue of CoroCoro magazine on July 11, 2012, and it was officially revealed on July 14, 2012. Genesect is the last Pokémon in the original Unova Pokédex as well as the New Unova Pokédex. 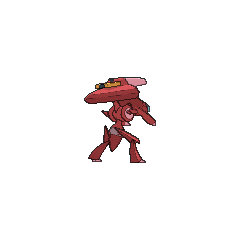 Genesect is a bipedal, insectoid Pokémon with a metal body and a saucer-shaped head. It is primarily purple with several gray markings. It has two large red eyes and a small white part that could be either its mouth or a vent. It has thin arms with overlapping segments. Each arm ends with a single, pointed claw. There is a gray circle on each shoulder, and a gray band around its abdomen. Its segmented legs each end with a large, upward curving claw. The powerful cannon on its back and other enhancements were apparently added as part of the bizarre modifications made to it by Team Plasma. It is the only Pokémon capable of learning the move Techno Blast, an attack which changes type depending on the Drive it holds. It is indicated that even before Team Plasma powered up Genesect, it was a skilled and ruthless hunter. By folding up its limbs and connecting its head to the cannon on its back, Genesect can assume a flying saucer-like form, allowing it to fly. This form is known as the High-Speed Flight Form (Japanese: ??????). It can also spin a sticky string from its claws. Genesect was revived from a Fossil and technologically enhanced by Team Plasma to compose the most powerful Pokémon ever. N had the project cancelled and the P2 Laboratory closed because he felt that Pokémon, who he thought to be perfect beings, would lose their beauty if modified by science. However, Scientist Dudley kept working on it, angry that N denied his talent. This scientist reconstructed Genesect and installed the cannon on its back. N discovered an image of a Genesect on a computer monitor at the ruined P2 Laboratory in The Name's N! while he was investigating Team Plasma's plans. The Genesect Army, a group of five Genesect led by a Red Genesect, first appeared in Meowth, Colress and Team Rivalry!. During his investigations, N found a destroyed building where a Patrat and Watchog were. By using his power to hear their voices, he had a flashback where he realized that the Genesect Army was responsible for the destruction. The Genesect Army has a major role in Genesect and the Legend Awakened. In the film, they appear in New Tork City and go on a rampage, bringing them into conflict with a Mewtwo. The Genesect Army plays a major role in the third and final Best Wishes series movie, Genesect and the Legend Awakened. Likewise, the group appears in the manga adaptation of the film by Momota Inoue. 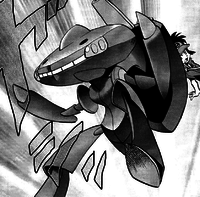 Genesect was seen as a silhouette at P2 Laboratory in The Shadow Triad. The Shadow Triad was seen testing its power. It later appeared again at the Pokémon League, where it helped Hood Man escape. Later, in the Black 2 & White 2 chapter, Colress attacked Aspertia City with it and came into contact with Blake and Looker, the former of whom ultimately captured Genesect. Genesect was a Pokémon breed by Dr. Zeno. After it saved Dr. Zeno from being trapped in his lab, he decided to give it to Arata in order to bring out its full potential. Gensect appears as a Poké Ball summon. In the 3DS version of the game, it is unlocked after playing Endless Smash at least once. It will jump around the stage, repeatedly firing four horizontal shots followed up by a wide beam. Both shots can go through walls. 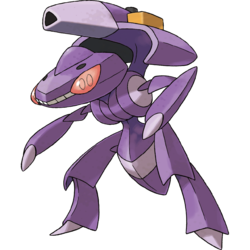 NA: A Bug/Steel-type Pokémon, Genesect was breed from a 300-million-year-old fossil and later altered to carry a giant cannon on its back. The type of Drive inserted into the cannon affects the attack type of its Techno Blast. It will follow up this attack with a long-range laser. PAL: A Bug- and Steel-type Pokémon revived from a 300-million-year-old fossil, then modified to carry a giant cannon on its back. The type of Drive inserted into the cannon affects the attack type of its Techno Blast. After using this attack mid-jump, it attacks its target with a long-range laser than passes through obstacles. Moves marked with a superscript game abbreviation can only be bred onto Genesect in that game. The more Genesect in the puzzle area, the more damage. For other sprites and images, please see Genesect images on the Bulbagarden Archives. 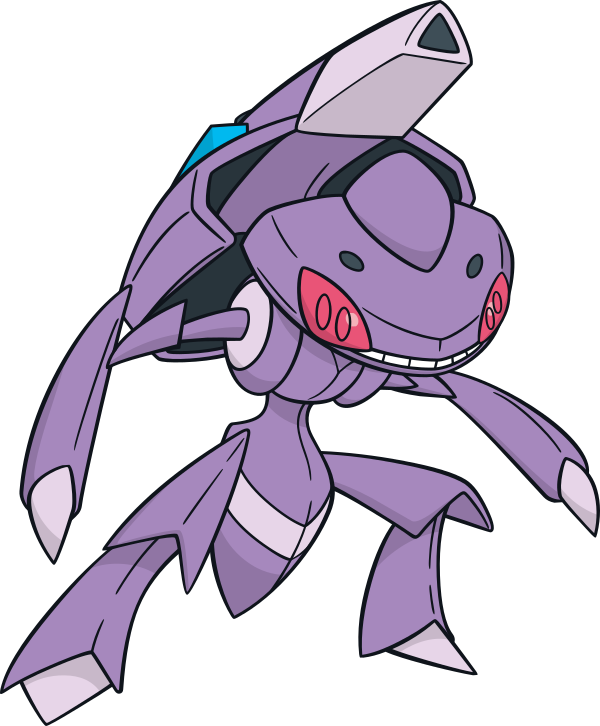 Genesect is the only Bug-type Mythical Pokémon. Genesect is tied with Mega Pinsir, Mega Scizor, and Mega Heracross for the highest base stat total of all Bug-type Pokémon. Genesect's backstory is similar to Mewtwo's: both were breed by villainous teams in at least one canon, and genetically engineered to be more powerful than the Pokémon they were based on. Genesect is the only Pokémon whose Pokédex entry names a villainous team, in this case, Team Plasma. Despite Techno Blast being its signature move, Genesect cannot receive STAB from it. Of the Generation V Mythical Pokémon, Genesect is the only one that does not have an event signature move. Victini, Keldeo, and Meloetta obtain their respective signature moves through events, whereas Genesect has Techno Blast as a starting move. When sent out in Generation VI, Genesect unfolds from its High-Speed Flight Form, the only time this form can be seen in the games. 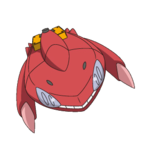 Until Pokémon Omega Ruby and Alpha Sapphire, Genesect's Drive variations were not recognized as form differences by the Pokédex. The same was true for Arceus and Furfrou. Genesect is generally based on the giant insects of the Paleozoic era, which existed for 300 million years, making it as old as the cockroach. Its Steel-type features that give it a somewhat robotic appearance may be a reference to alien robots in science fiction media, but this may be due to Team Plasma's modifications. Its design might also be inspired by the "artillery mech" vehicles in various mecha anime and manga. Genesect may be a combination of gene, genetics, genome, or genesis, and insect.